Problem management is often accused of doing very little more than dealing with the aftermath of incidents. Whilst this performs a useful function, often providing some useful information which incident management can use next time, it’s a long way from reaching the full potential of a mature problem management capability. The need to forge stronger links and provide greater benefit to incident management is as strong as ever. Add to that the desire for proactivity, whilst maintaining an appropriate balance between reactive and proactive and it’s understandable why this is proving a challenge for many. Our panel of experts will discuss these challenges and offer advice and guidance based on their significant experience. 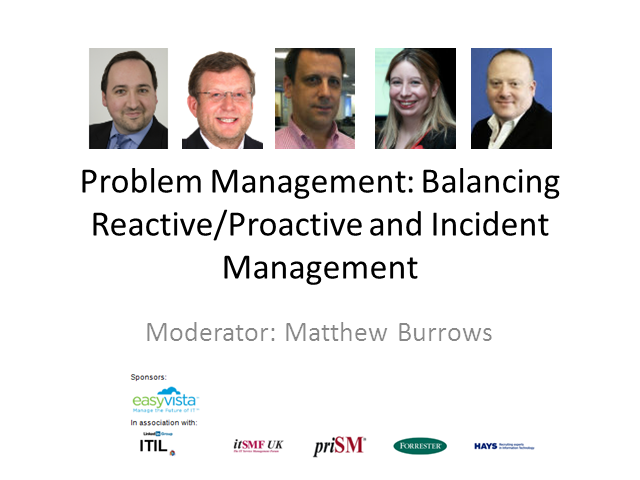 Bring your problem management questions to this session and we’ll try to deal with as many of them as possible. EXCLUSIVE TO LIVE ATTENDEES: By attending this live panel session you will be given the opportunity to download the EasyVista whitepaper, "Codeless Customization Gives Enterprises a Three-Fold Transformation In TCO" for free.